The holidays can be an especially tough time for some, and so local charities like The Exodus Foundation have found ways to give back to the community during the Christmas season. Their big Christmas Day lunch for the homeless requires countless community members coming together to volunteer their time and spirit — volunteers help in the kitchen, serve meals, show guests to seats and provide comfort to those who are missing loved ones. Whether they’re sorting food donations or packing Christmas food parcels, these volunteers work together as a team to prepare over 70 hams, 55 turkeys and roast half a tonne of veggies. Volunteering not only provides individuals with a new perspective and empathy, but helps us acknowledge our common goal: a better future for all. The Exodus Foundation also runs a gift drive, where community members are invited to drop off toys under the Christmas tree in the Target store at Burwood Westfield, or at The Exodus Foundation, so that all children can experience the magic of Christmas. The holiday season is a time for giving, and there’s nothing more rewarding than a smile on a child’s face at Christmas. With your help, Santa can deliver presents to kids from the most needy families. 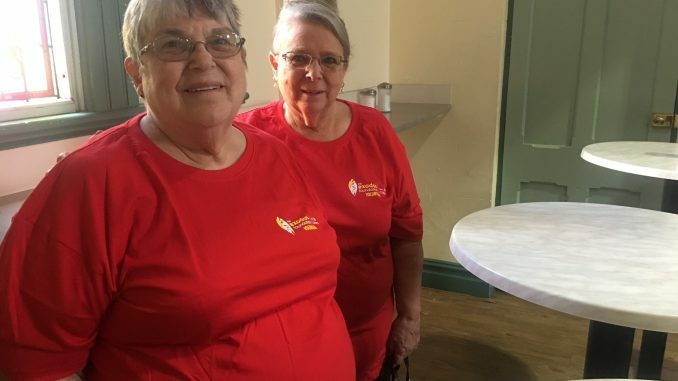 Pam and Di are sisters who volunteer at The Exodus Foundation and spoke to Ciao about what Christmas means to them and their favourite Christmas dishes. Why did you decide to volunteer for the Exodus Foundation? We saw what good things happened to people thanks to the staff and volunteers – we wanted to be a part of that. Can you describe the type of volunteer work you do around Christmas? It starts off with packing Christmas hampers and the gift packs for Christmas Day. We also love to help get Santa’s Cave ready for the kids – every one of them gets a present from Santa on Christmas Day. There’s a lot of work to be done in the kitchen too — getting all the food ready to feed 3,000 people is a big job! On the New Year public holidays we work in the restaurant if there is any energy left in us! We love Christmas — it is a time for joy and it should be spread around. Of course Christmas is also about celebrating the birth of Christ, and the idea of peace to all men and women. What has been the most rewarding moment from volunteering at Christmas time? Seeing the kids come into the sweets hall after being at Santa’s Cave and seeing the excitement and joy on their faces after receiving their presents. Also, the buzz of the Day! How would you describe the Inner West spirit during Christmas? There is a lovely community feel – the Christmas decorations and the people sharing the spirit of the season. What’s your favourite Christmas dish? brandy beating all the time. Then gradually add cream. Refrigerate till required.